Gain the knowledge and skills to become a licensed plumber with a Certificate IV in Plumbing and Services at Victoria University Polytechnic. This course is designed for registered plumbers and final-year apprentices looking to extend their technical skills and knowledge. You’ll be prepared to gain your plumbing licence with the Victoria Building Authority (VBA), subject to passing the VBA exam. You’ll graduate with a nationally-recognised qualification, ready to operate as a contractor plumber or to start your own plumbing business. 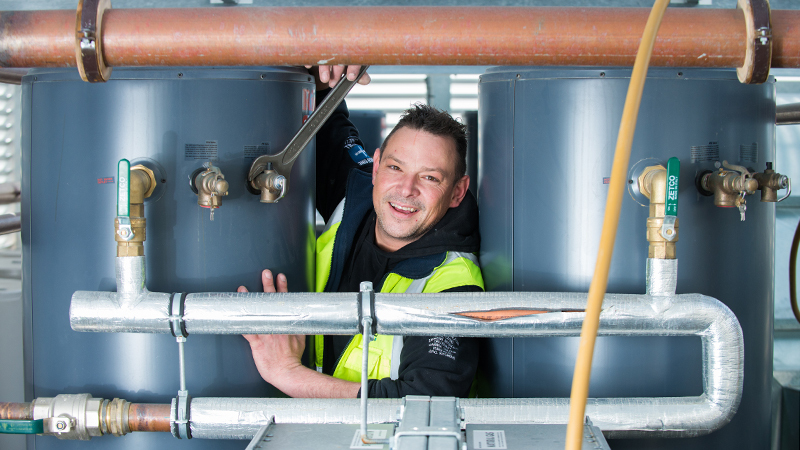 Trades students from Victoria University Polytechnic are consistently recognised for industry awards and in skills competitions, such as this plumbing apprentice who won bronze at an international competition. This trade certificate will allow you to move into positions of responsibility in the plumbing services industry. Subject to passing the VBA licensing exam, you will be eligible to work as a licensed plumber, able to supervise registered plumbers. Mature-age apprentice Mark Thistlewhite decided to leave cooking for plumbing and hasn’t looked back. To be awarded CPC40912 Certificate IV in Plumbing and Services, a student must successfully complete a total of fifteen (15) units of competency. Plumbing and services - Operations stream. no more than three (3) units may be selected from the list of elective units common to all streams. provide and transmit solutions to a variety of predictable and sometimes unpredictable problems. Graduates at this level will apply knowledge and skills to demonstrate autonomy, judgment and limited responsibility in known or changing contexts and within established parameters. Applicants must have successfully completed the Certificate III in Plumbing or equivalent.